As a car enthusiast, there are a few movies that I hold dear to my heart. There’s Gone in 60 seconds (the original from 1973), Days of Thunder, Ronin, Rush, and, of course, the countless versions of The Fast and the Furious. One of the most legendary films, Bullitt, set the bar very high for car chases. It stars Steve McQueen as Lieutenant Frank Bullitt. He and his fabulous 1968 Ford Mustang GT 390 are involved in a phenomenal chase to try and catch the bad guys and their black Dodge Charger. Steve McQueen did all his own stunts, showcasing his talents both as an actor and a driver. Any self-respecting car fan, especially those who like American muscle, know the famous car chase scene from this otherwise unexceptional film. So it should come as no surprise that Ford wants to capitalize on this fame, even though they refused to contribute to the film at the time. In fact, the Mustang used in the film was stripped of all its logos at the request of the manufacturer. Also: 1968 Ford Mustang GT: Hello, Frank Bullitt! Also: The Ford Mustang Bullitt is Back! Despite this, Ford released a few Bullitt editions of the Mustang in the not-so-distant past. There were the 2001-2003 and 2008-2009 versions that were built in limited quantities and are today highly sought after by collectors. The myth surrounding this car remains, even after all these years. Now, to respect the hierarchy of the bygone version, Ford had no intention of offering a Bullitt version of a GT350 or the upcoming GT500. It’s offered exclusively on the basic Mustang GT, with a few carefully modified and highly characteristic elements. On the outside—predictably—the colour is the original Dark Highland Green. For those of you that wouldn’t be caught dead in a car that colour, you can order it in black instead. So much for the myth, right? Most diehards would consider it sacrilege to order this car in anything but the original colour. Did you know that, in 2001, Ford dared make a blue Bullitt? It was only offered in the United States and there were just 722 units produced. 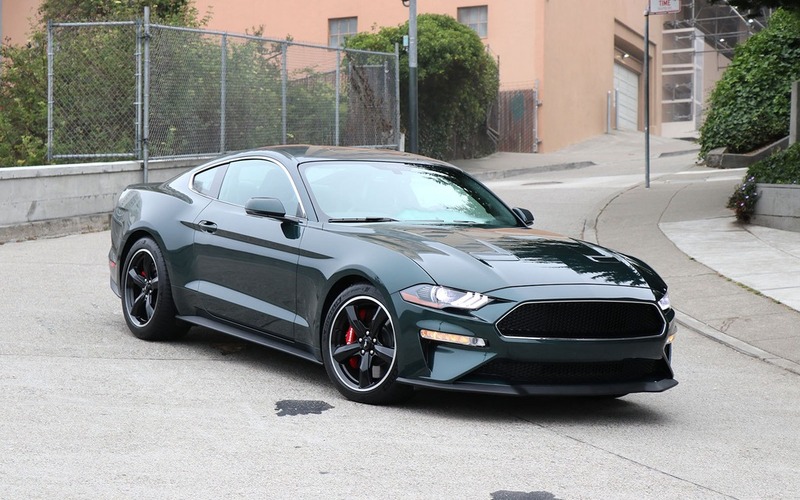 The new Bullitt stands out with a unique grille with no fog lights and a slim chrome moulding that matches the window trim. Exclusive black rims and Bullitt logo between the taillights also distinguishes it from other versions. The look is otherwise rather discreet. Starting the engine is anything but discreet. Thanks to the Shelby GT350’s intake manifold and a slightly modified exhaust, it emits a truly captivating sound. Driving around the streets of San Francisco, where the movie Bullitt was filmed, the residents, clearly unimpressed by the roar of this Mustang’s engine, gave us a death stare. But fear not: I had the good sense not to make the tires screech, bounce the tail end or leave a few hundred feet of skid marks on the street like Steve McQueen did 50 years ago. It goes without saying that driving this edition of the Mustang in the place it was born stirs up a lot of passion. We convincingly pretended to be Lieutenant Bullitt, for a brief moment in time, as scenes from the film flashed in our heads. Few cars are able to inspire that kind of passion. With 480 horsepower (20 more than the Mustang GT), the Bullitt provides thrills akin to those of an exotic car. The 5.0-litre V8 is ideally paired with an irreproachably precise manual gearbox. Easy to handle, agile and well balanced, this Mustang has a typically American personality while being every bit as agile as an acclaimed German car sold at a higher price. In fact, to get this much performance, you’d easily have to spend $15,000 more at Audi or BMW (S5 or 440i coupes) and sacrifice a lot of thrills. I would add that the instant response of the accelerator constitutes a real asset for this Mustang, while the competition’s throttle lag puts a major damper on fun. At the wheel, you can set the handling to be user-friendly, really sporty or programmed for straightaway acceleration. Simply select one of the various driving modes to adjust the firmness of the suspension, power management and, of course, the sound of the exhaust. The Bullitt sprints fast, but comes to a halt just as easily thanks to the high-performance, extremely resistant Brembo brakes. It’s hard to compare the latest Bullitt’s cabin with that of the 1968 Mustang GT 390. Today, it’s so luxurious that it even surpasses the German competition—at least in terms of standard equipment. Heated and ventilated seats, B&O Play sound system, SYNC3 with navigation and leather upholstery are all included, with the only option being the firmer, race-designed Recaro seats. Noteworthy features include a 12-inch programmable central screen that, as soon as you start the vehicle, reminds you in no uncertain terms which car you’re driving. 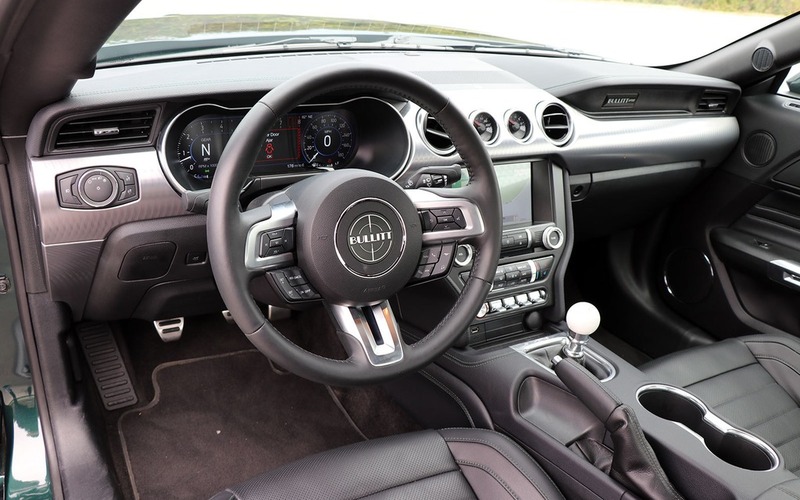 The Bullitt emblem in the middle of the steering wheel confirms it, as does the numbered plaque located above the glove compartment. You’ll also find green stitching that, although subtle, reinforces the car’s personality. 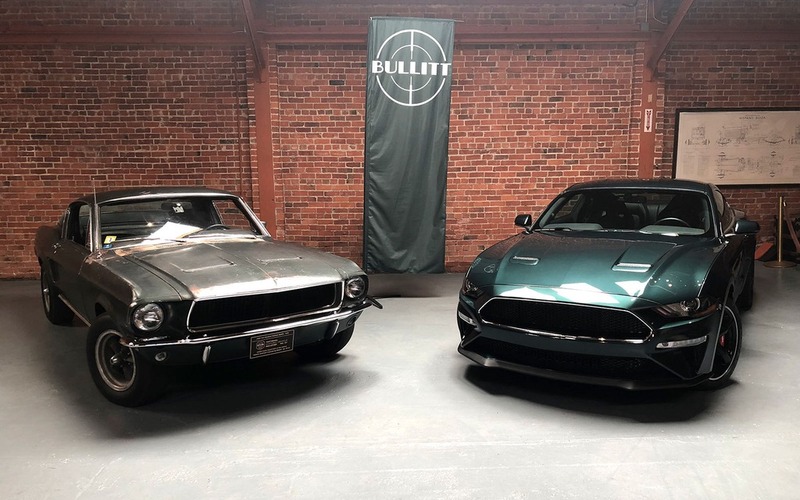 In conclusion, notice that the new Mustang Bullitt is pictured next to the original in the photos. One of the two cars used in the production today belongs to New Jersey resident Sean Kiernan, who inherited it from his father in 2014. He had purchased it in 1974. Kiernan keeps it in its original condition and obviously prefers to rent it (undoubtedly for big bucks) to the folks at Ford rather than sell it to them for an astronomical sum. As a result, the myth of Lieutenant Bullitt, and of Steve McQueen himself, is only growing as the years go by. 7/10	Reasonable considering the level of performance. 8/10	Surprising comfort, good soundproofing, which makes it a pleasant car for everyday use—in summertime. 10/10	Not only is the Bullitt fast, but it handles exceptionally well, to the point of being compared to many acclaimed German cars. 9/10	The in-house navigation system isn’t simple, but the infotainment unit is efficient overall, especially with what Apple CarPlay/Android Auto bring to the table. 10/10	Tough to beat, especially in this price range. 9/10	An iconic car that stirs up passion and remains faithful to the original, despite its cutting-edge mechanical elements. 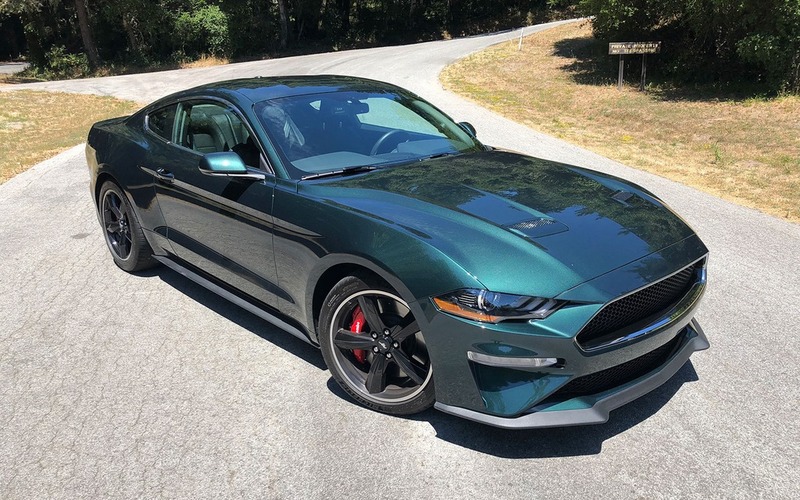 Test Drives 1968 Ford Mustang GT: Hello, Frank Bullitt! Detroit The Ford Mustang Bullitt is Back!